cyberaditya: Why do 250GB hard disk having less than 233 GB? Why do 250GB hard disk having less than 233 GB? This was a question that one of my friends asks me after buying a new 250GB Hard Disk. I really didn't ask that question to myself. So, I couldn’t answer that instantly. After a few days of information searching I realize the truth. So, here I’m going bring the facts the way I told my friend. 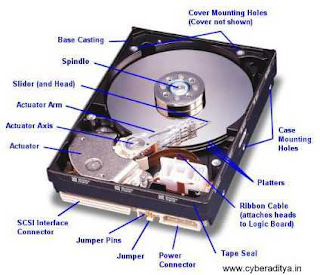 All Hard Disk manufacturer way of counting space is different from the way a software count a space. This means to a Hard Disk Manufacturer, 1GB is 1000 MB, 1 MB is 1000 KB and so on. Software or computer language recognize a space in terms of power of 2 say 21, 22,23 etc. hence a KB is 210 Bytes which is 1024 Bytes. Now you’ll see why your 250GB hard disk has only less than 232.83 GB space in total. Well if you go with higher space like 500 GB and so on the space missing is increasing.